Truth is, most NFL general managers would salivate to have the Saints’ roster, and not just because of #9. It has the right blend of talent, experience and depth. This will not be an easy roster for many players to make, with the final cuts pending shortly, so front office pirates in the league will have their eyes on which ones stream across the waiver wire, looking to steal a late addition for their teams. In the personnel arena, the Saints, since Katrina, have somehow performed a hat trick, inconsistent with most of their history. The pivot is on for Reggie Bush in New Orleans. There is no player with more upside for a fifth year veteran in the league, he having missed lots of time due to injury. Because it is the last year of his fat contract, detractors are having field days, saying ‘dis is it for him. But that’s about business. Insofar as football is concerned, his talent and value to the team have never been disputed here, nor will they be now. Reg-gie has once-in-an-era ability, even if manifested on the field less frequently than citizens of The Nation would like to see. Perhaps this is the year Sean Payton should think less about how he utilizes #25, and like the title to former all-pro receiver Keyshawn Johnson’s book says, Just Give Him The Damn Ball. With turnover and the injury bug at the running back position on the team, this may be a timely mandate. And the Saints are quite fortunate to not have pushed the envelope too far, or Pierre Thomas away, in his contract negotiations this past off-season. Without him, there would have been no Super Bowl stories in the Big Easy, period. Up front, things are stable with the Stones Of the Saints offensive line, though left tackle Jermon Bushrod will have to have a repeat performance in proving he can protect the blind side of Drew Brees, other than as a replacement for the now departed Jammal Brown, though another promising Brown, a draft pick from USC, waits in the wings as insurance. Guard Jahri Evans is the league’s highest paid at his position, ever. He makes big quarterback money and nobody’s wincing. There’s no reason to think the Stones will not pull off worthy encores in the Superdome, like Mick Jagger did. On defense, everybody in New Orleans still wants to know, are the levees fixed? The Saints let go miles of yardage between the 20’s last year, but did hunker down in the Red Zone, and cashed in turnovers. If opponents hold onto the ball more, and don’t miss as many field goals, this unit could come under scrutiny. Their theme song playing in the locker room should be Olivia Newton John’s Let’s Get Physical, as in standing up opposing running backs in their own backfield, and knocking some bobbleheads off with snap crackle pop, hi-lo tackling action. It will be a good sign if you see opposing receivers suddenly growing alligator arms when reaching out for passes over the middle. Jonathan Vilma’s injury has exposed that the linebacker position has lots of younger players with potential, meaning they haven’t really done anything yet, the area of most concern on this side of the ball. The Saints turn of personnel fortunes are no more evident than in their defensive backfield, where it is actually crowded with guys who can play. This feels like the aftermath of a lobotomy for Saints fans, as quite the opposite has mostly been the case here. Cornerback Jabari Greer is one of handful of the best cover men in the league and is a cinch all-pro, barring injury. Malcolm Jenkins will feel more relaxed in his second year. There is the rookie, Mr. Robinson, and Darren Sharper is back. Roman Harper needs to get beat less over the top at safety. The Saints biggest opponent this season isn’t on their schedule. Human nature tends to relax after a big campaign. Expect the team to play with less urgency, but more confidence all year long. And never feel out if it, though on occasion they may look like it. Nostradamus swung by and said it is a good omen that the Saints play at Dallas, site of the next Super Bowl, on Thanksgiving, a forebear of them having played the Dolphins in Miami during the past regular season. But he was eating chicken wings, as in dirty birds. Just in off a flight from Atlanta, he told the Falcons that they have the pieces in place to make the Saints hold onto their necks in the chase for the division crown. This will be no cakewalk like it was last year, so dessert is out of the question for the faithful right now. Hotlanta was rumored to be practicing We‘Dat. But like pre-season, it’s only practice. On his way out, I grabbed him by the back of his robe and asked him if the Saints would make it back to the big dance. He said there will be one playoff game at home, and to flip a coin if the road to Dallas in winter goes through New Orleans. Fortunately, he said, hat tricks can become learned, repeated behaviors. But I did notice his robe was black, with gold trim. 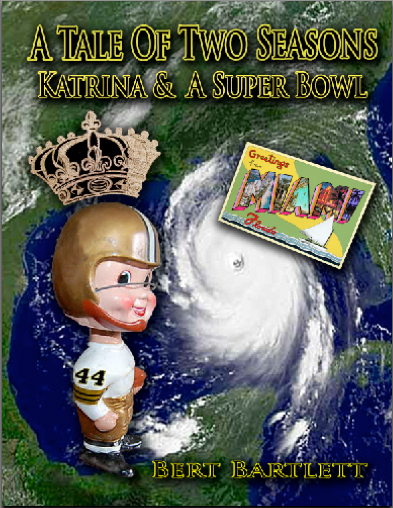 Posted in Uncategorized.Tagged A Tale Of Two Seasons, Big Easy, Black & Gold, Hat Tricks, Hurricane Katrina, Jabari Greer, Jahri Evans, Jermon Bushrod, Jonathan Vilma, Just Give Me The Damn Ball, K+5, Keyshawn Johnson, Malcolm Jenkins, Mick Jagger, New Orleans Saints, NFL, Nostradamus, Olivia Newton John, Pierre Thomas, Pro Football, Red Zone, Reggie Bush, Roman Harper, Super Bowl, Superdome.